Traders are waiting for the macro economic data and the impact of US-China trade war on EURUSD. The support rests at 1.13040 with resistance at 1.13820 which both lines are below the weekly pivot point at 1.14310. The EMA of 10 is moving with bearish bias in the descendant channel and it is below the EMA of 200 and the EMA of 100. The RSI is rising towards the 50 level, the Stochastic is showing upward momentum and the MACD line is above the signal line in the positive territory. The ADX is showing buy signal. 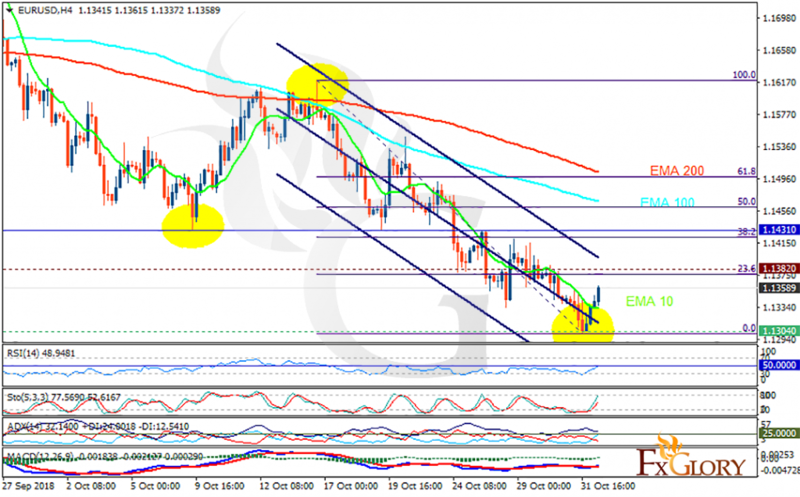 The indicators are showing bullish signal and if the correction pattern starts, buyers can target 61.8 level of Fibonacci at 1.15. however, EUR is still under pressure due to weak economic data.